"Results"" -- by by Louise Ellis. Julian Bashier helped show Beverly and Jean-Luc that they were beginning to take each other for granted in "Truths and Consequences." This issue, she follows that situation. "Choices" -- by Ulrike Schaefer. Everyone has to face them at one time or another. Beverly once again has something to tell Jean-Luc, but she's injured before she can do so, forcing him to make a choice that will affect their futures--if they have one. "The Targ and the Sehlat" -- by Martina Jarrett. Did you ever wonder exactly how Miles O'Brian and Keiko met? Or if Keiko is really as reserved as she seems to be? Data and Deanna find out when they visit with Miles and Keiko. "Double Action" -- by UIrike Shaefer. Parallel universes are the same until one small detail causes them to split. Unfortunately, that one person who caused the split gets caught in an anomaly and ... one ship's crew is seeing double with two Beverly Crushers. After all two heads are better than one. "The Death" -- by Lisa Ann Richardson. 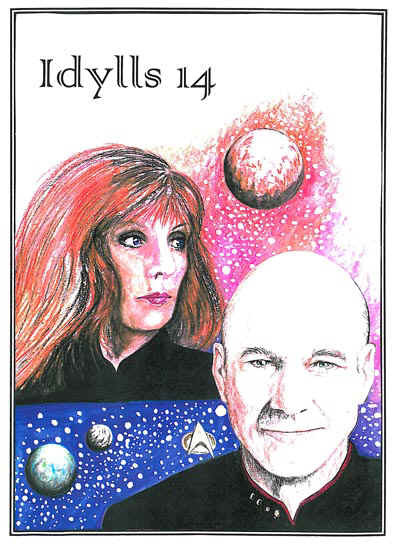 Perhaps a bit of that telepathic link did remain between Jean-Luc and Beverly after their return from KesPrytt. A tragic shared dream draws the two of them closer and creates a new future. "Tin Soldier" -- by Rosemary Cullen. In the future, Data had his own command, until the ship was destroyed, and now Will Riker seeks out Jean-Luc and Beverly Picard with clues that their friend may not have perished in the explosion after all. Follow the clues with Will and Jean-Luc as they unravel the mystery. Artwork by Aria Fontaine-Kerins, Glenn Lash, MJ. Millard, Gabi Stiene, and Zaquia Tarhuntassa. 112 pages, 8½" x 11" size, comb binding, color cover.